Looking to brighten up your office or bathroom? 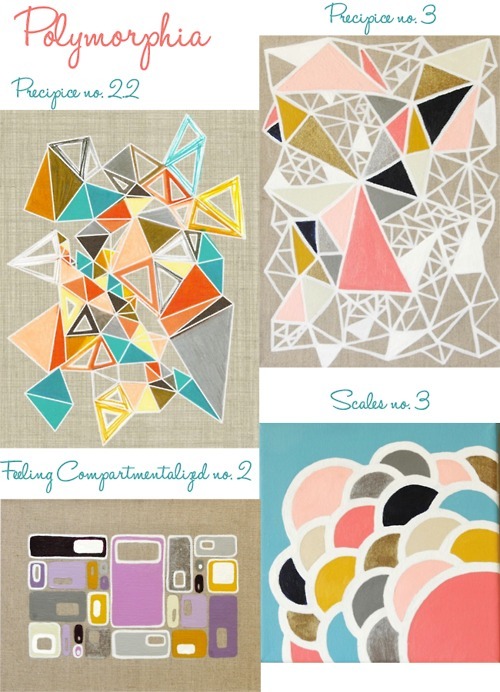 I highly recommend these funky paintings with vivid colors and geometric designs by Crystall Jackson, owner and artist for line Polymorphia. While the colors she uses are quite loud, she paints on linen which downplays the final look, giving it a relaxed and comfortable feel. Not only is the art nice to look at, but so is the price tag. With prints starting at $30, these paintings are great foranyone looking to add some color and fun to their living space. Would make a great gift for a family friend living in a college dorm or small apartment (graduation is coming up!! ).